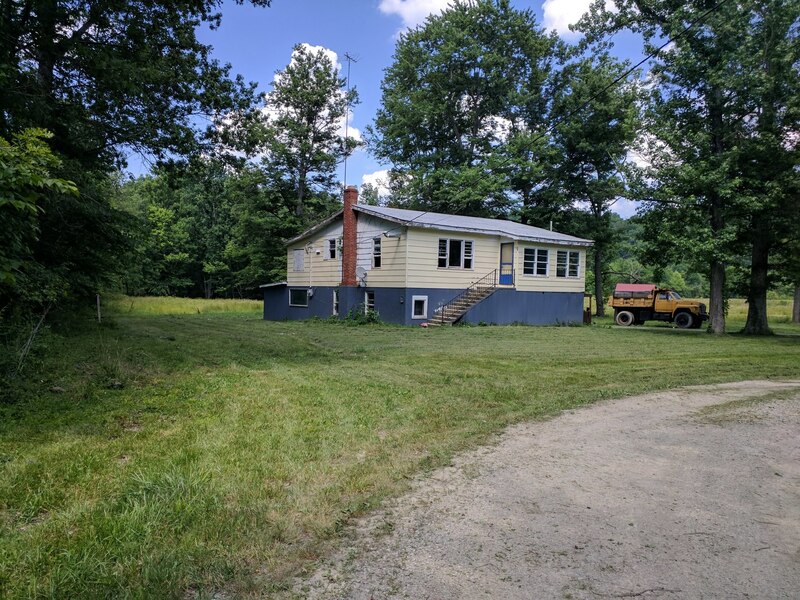 Chris congratulations on the homestead buy and the engagement. I have nothing to say but you have a lot of work ahead of you. cash I had in 2015: $3000. One hour drive from most of my work in and around Nashville. I have since removed a couple dozen trees and moved my two portable buildings there. With my solar panels I have electricity and I haul water and propane and I compost instead of use a septic. 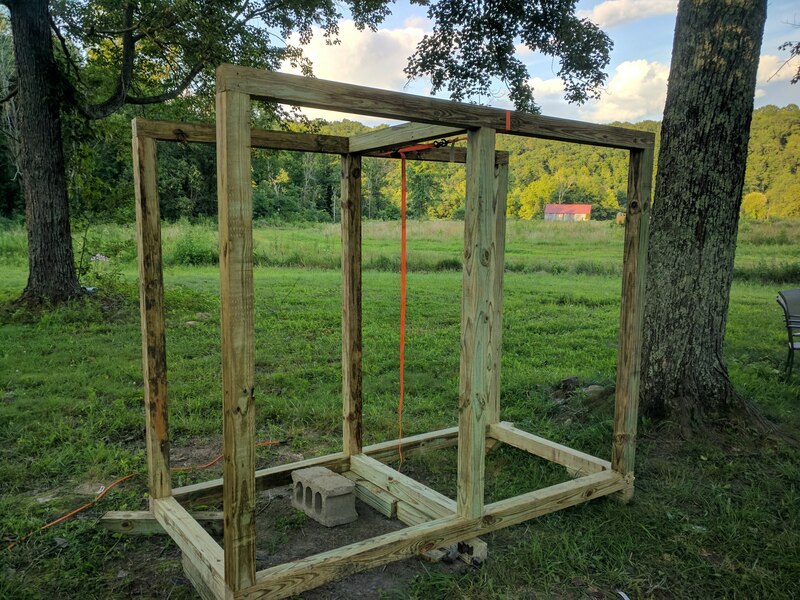 In 2016 I built a micro home on wheels 5x7 to go storm chasing in Florida and recently I almost finished it with solar panels, a 900 amp hour battery, and I have a mini-fridge waiting for me back home. 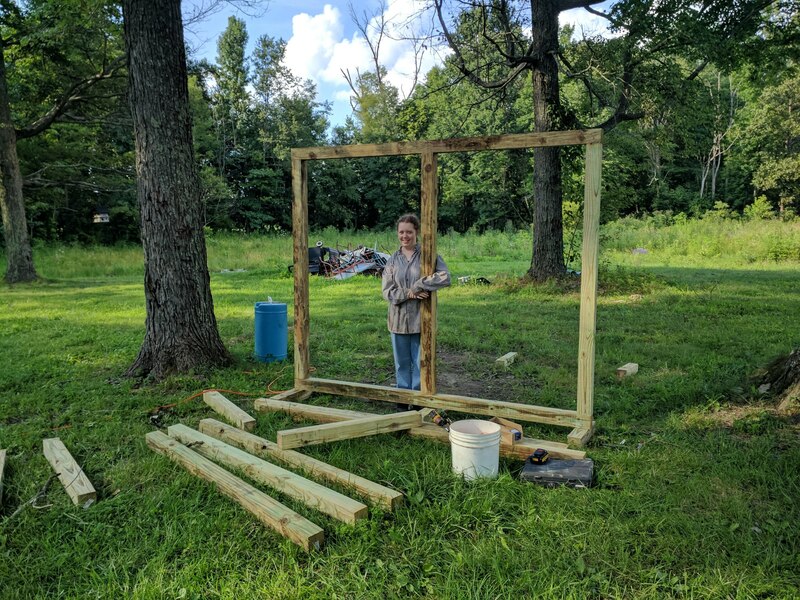 Next is organizing my shop (19x20 carport) and finishing the 12x30 portable apartment to make it live able for my mother. 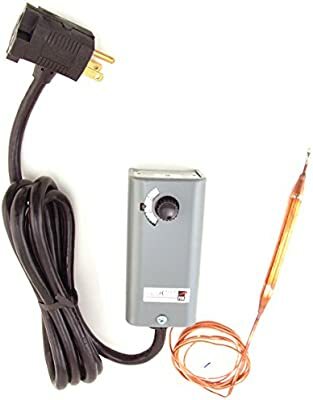 I have a 5000 watt 240 volt inverter on the way and a 240/120 volt transformer. I have everything I need and it’s all paid for. My taxes are $7 a month. So much potential with some TLC. I’m a fan of sweat equity. I’ll be watching closely to see you and your family shape this land into your visions. 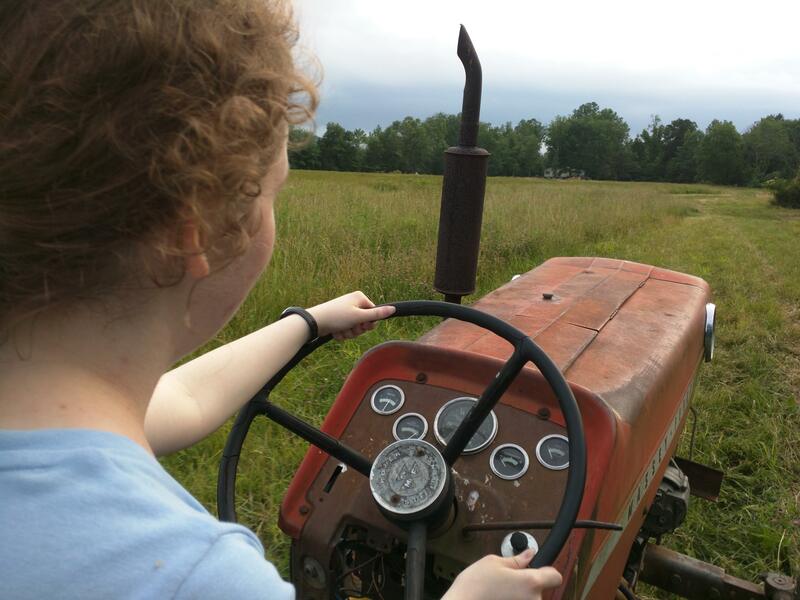 Chris, the tractors look good BUT, no ROPS. At least, they have the wide front end. The flatbed has Hendrickson walking beam rear suspension. That’s about the best that you can ask for when you need traction. The dump truck will probably have a 429 or 460. Notorious gas hogs. I had some mold problems in my log house. I got a good ozone generator and, it kills everything. It also works for removing smoke and smells. From your earlier description, I thought that the 10whl truck had a 5 speed with a 3 speed Browny. You said that it is a 15 speed Road Ranger so, that is a different animal. There are lots of vids on driving them. Essentially, you put the button in low and, shift through the 4 gears. Then, you move the button to direct, and shift through the 4 gear pattern again. Then, you put it in overdrive and, shift the normal 4 gear pattern once again. You definitely have your work cut out for you. Been too busy to post much here, but here’s a couple photos at least. Name of the game is currently bush-hogging. 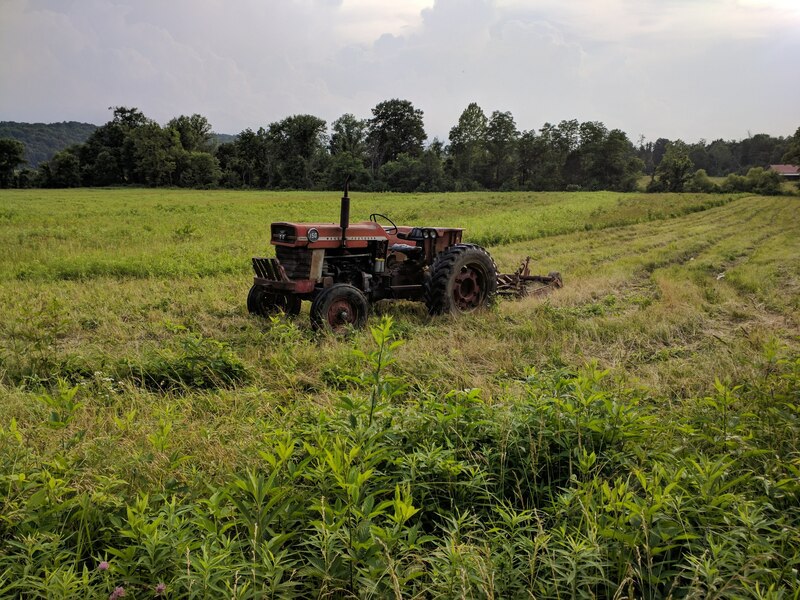 We’ve got a ton of weeds and overgrown pasture that needs attention. 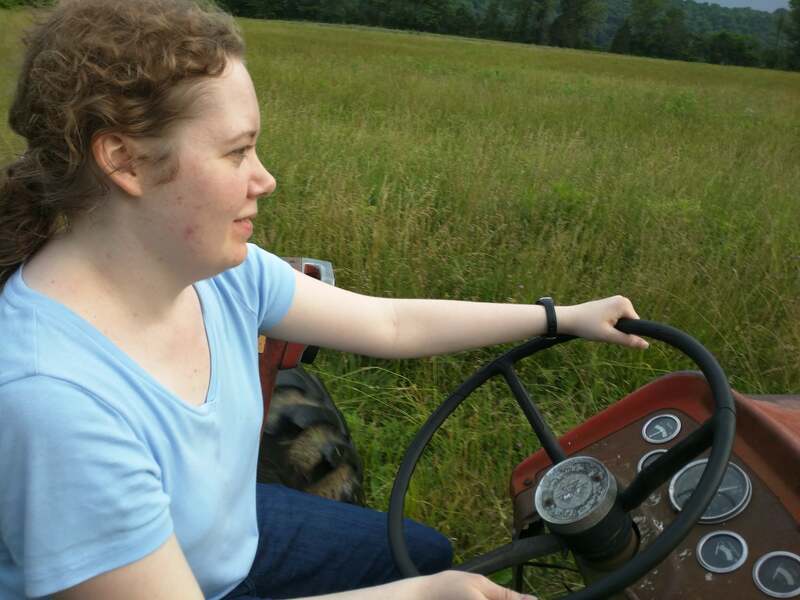 I’ve been teaching Mary to drive a tractor as well. Mowed around the house too, it looks much better. That is my two cents worth of advice coming from someone fighting with more fields then time. It looks nice there. Great to see your getting some help trained too… now you have more time to build gasifiers… LOL. What Dan said, but my general rule of thumb is drive over the brush now while you still can, but do it right before you sharpen blades. 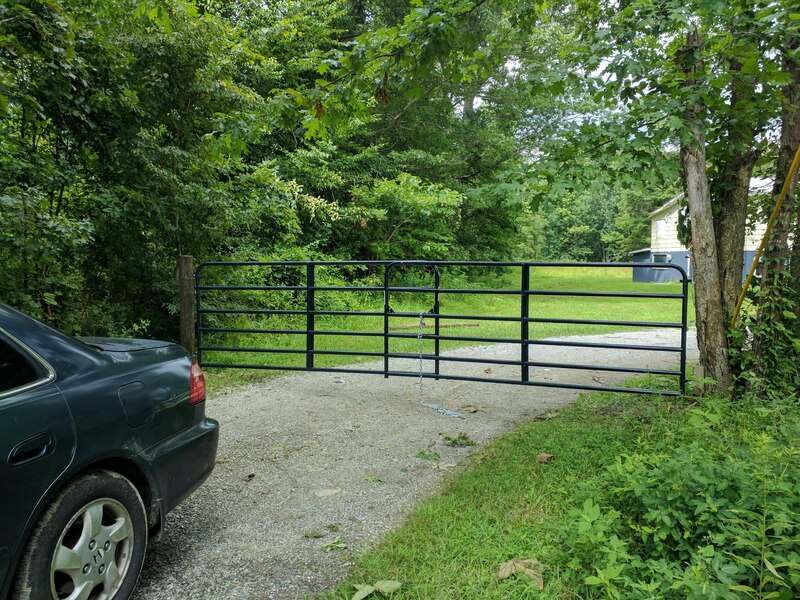 Gates across the driveway. I’m not super concerned about security, but this will at least keep someone from hauling everything I own away in a single truckload. They look decent. I dug the fencepost hole by hand, that was a chore, but pleasant work. The other side is mounted to a handy tree. We have since put up a short bit of fence to close the gap to the treeline. Carpet and linoleum have been removed. This house had a pretty bad odor, and the nasty old carpets had to go. 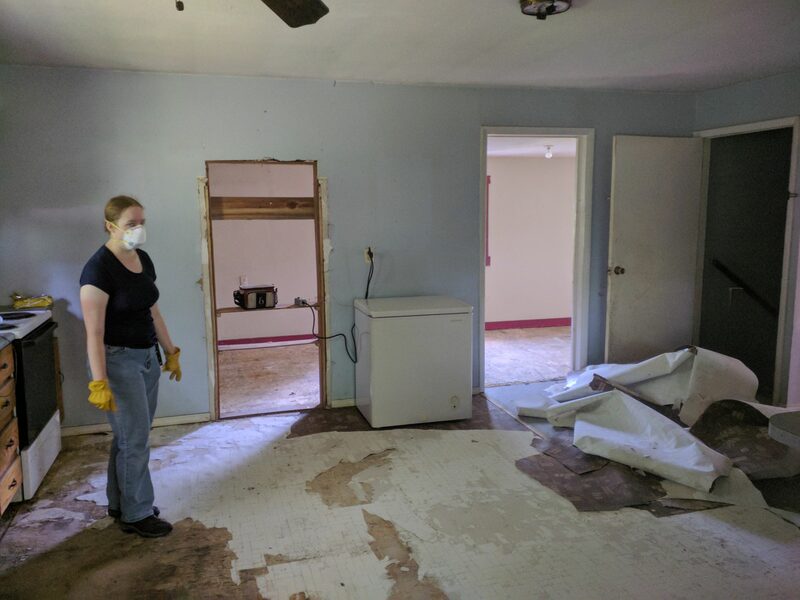 The kitchen linoleum was very worn out and had a lot of water damage. We’ve torn it down to bare subflooring. Also note the chest freezer in the photo. I’ve actually converted it to a refrigerator. This is an experiment I’m trying, to save some power vs a regular upright fridge. Seems to work quite well so far, however I haven’t measured the power consumption. Walls removed. 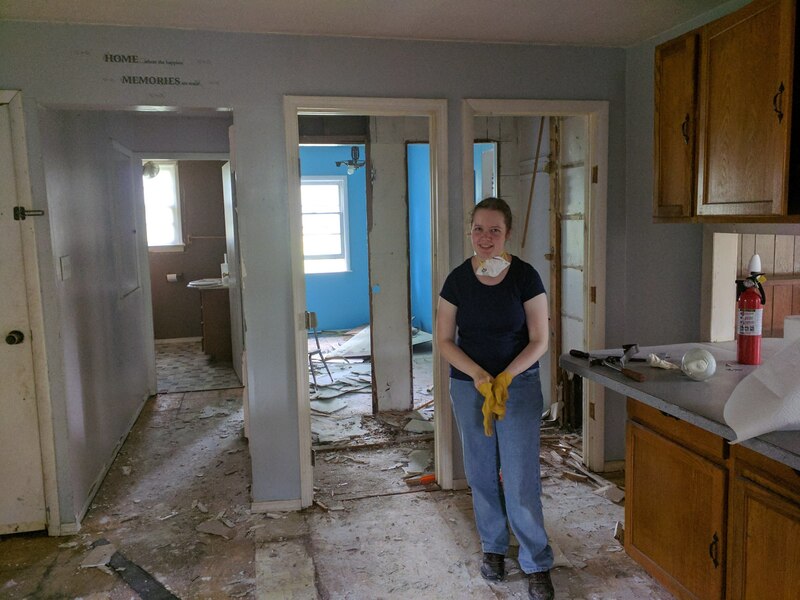 Closets and bathroom walls are being taken down, and we’re rebuilding the bathroom in a different place. One wall is getting opened up significantly, but we’ll be consulting an architect to avoid load bearing wall issues. Tearing out old drywall and poorly built closets is a surprising amount of fun. Outdoor shower. This one’s not done yet. We decided it will be a very useful thing to have around, since the bathroom is being redone, and there’s no running water in the house yet. Given the amount of ticks, chiggers, and poison ivy, a good shower is important. It will be nice to have one right away instead of driving to Frankfort first. Of course bushhogging continues. A flat tire has me sidelined temporarily, but I’ll be back at it very soon. I’ve actually converted it to a refrigerator. This is an experiment I’m trying, to save some power vs a regular upright fridge. Seems to work quite well so far, however I haven’t measured the power consumption. Looking good Chris. Where’s that swing? I am interested in your experiment. A bunch of the guys used to do that with solar freezers in the Amish community where we lived. They would hook them up some way to make them only be refrigerators and get away with much less power. I’ve put the kill a watt on the freezer and it uses less that half the power of the fridge in freezer mode. I assume it would use half again in fridge mode… Of course I totally want to order that thermostat now before the freezer gets filled up again in the fall! Congrats on the nuptials!!! Hey Chris, Maybe too late but consider making the outdoor shower into a “steam house crapper”. 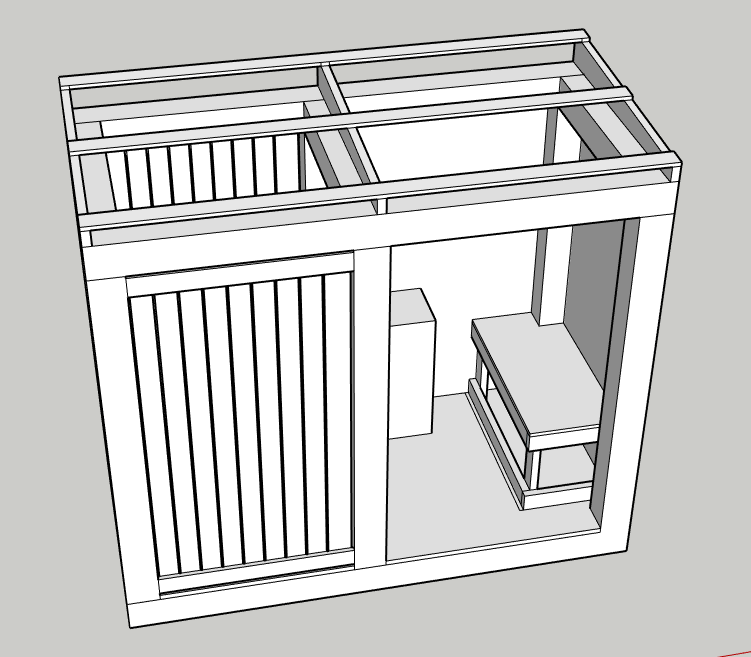 By making an 8 X 8 building with a door in the middle, you can put a shower stall on the left and a charcoal composting toilet on the left. The building also contains a TLUD stove to heat water for the shower or rocks for a sauna (hence the name “steam house”) Of course the TLUD stove will also make charcoal that can be used in the crapper or used to filter the water comming from the shower. Your chunked wood is perfect for the stove. And the hot water is placed in a pump sprayer so you have water pressure hosing you off. And in the winter, the stove, near the shower, will help keep you warm. Gary in PA who is full of ideas and other stuff. 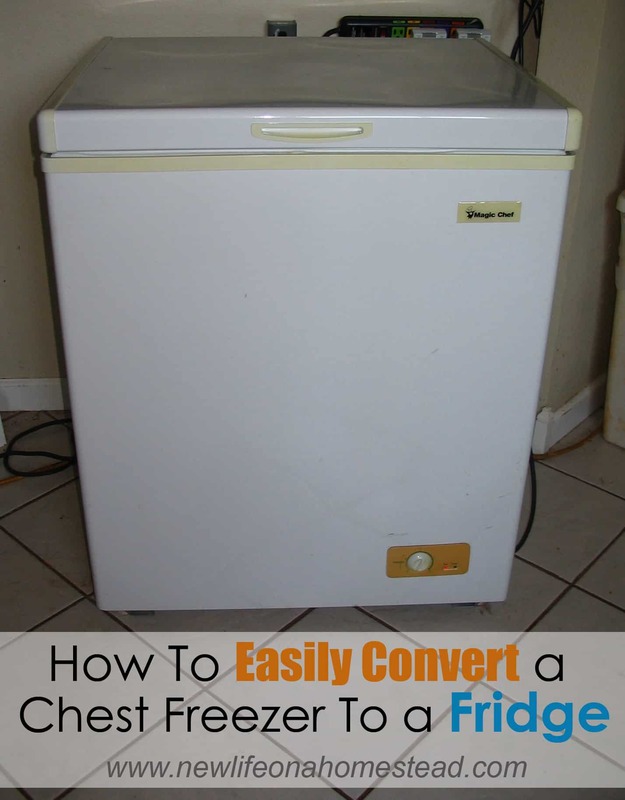 Here's the easiest way to convert a standard chest freezer into an energy efficient fridge which can be run on solar power. No re-wiring required! Compost toilet on the right, sink in the middle, shower stall on the left. Roof not shown for clarity. 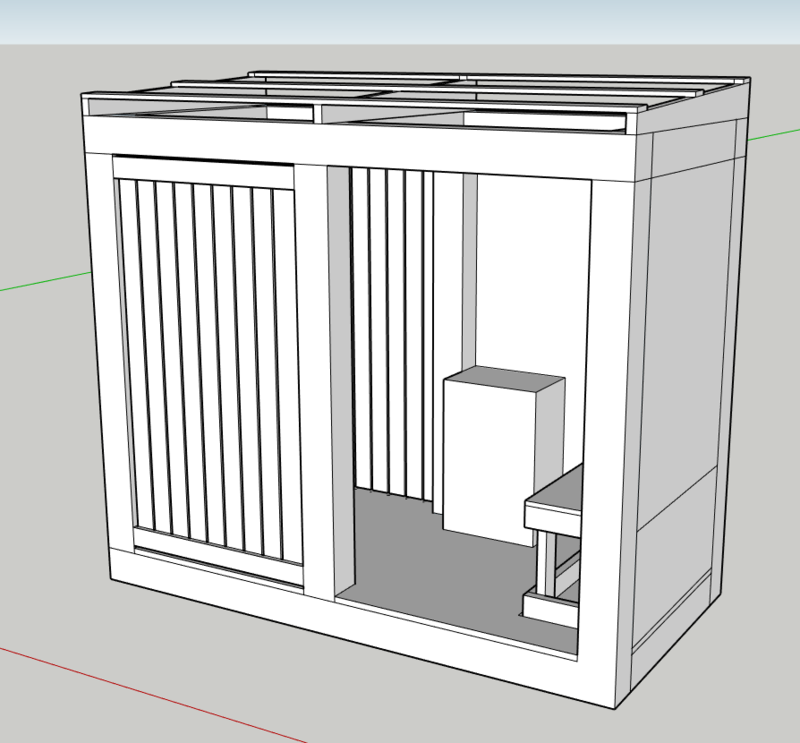 One more photo for you guys, I made a Sketchup model of the renovated house. The bathroom is all new construction, and is roughly the same spot as the closets we’ve torn out. The wall to be removed is on the front room (3 big windows) combining it with the master bedroom. You’ll also notice there’s a room off the kitchen which doesn’t exist yet, that will be the laundry/pantry. why not making a charcoaling unit , have the heat for the house and warm water, then use the charcoal for the good stuf from the dark side ? For that reason I don’t intend to use it. I’ll have a flue for the wood stove, which will be in the corner of the living room nearest the bathroom, as close to the center as I can get it. Fancy heating options like you mentioned will wait until the big house gets built. Chris if you use that chimney on the outside of the house do clean it often. I have a good friend who has one of those and he told me he has to clean it about 4 or 5 times a winter. I thought he was crazy and running the stove too cold until I went over to see for myself. He had good dry wood and ran a nice wood stove at the right temps. As much as I dont like a hole in the roof I have to admit that a chimney on the outside tense too be too cold. Chris, I’m not sure if you looked into tankless water heaters. This is the one we have been using. It does a great job for us. We use a 110V water pump from a RV. We store our water in a 55 gallon food grade drum. 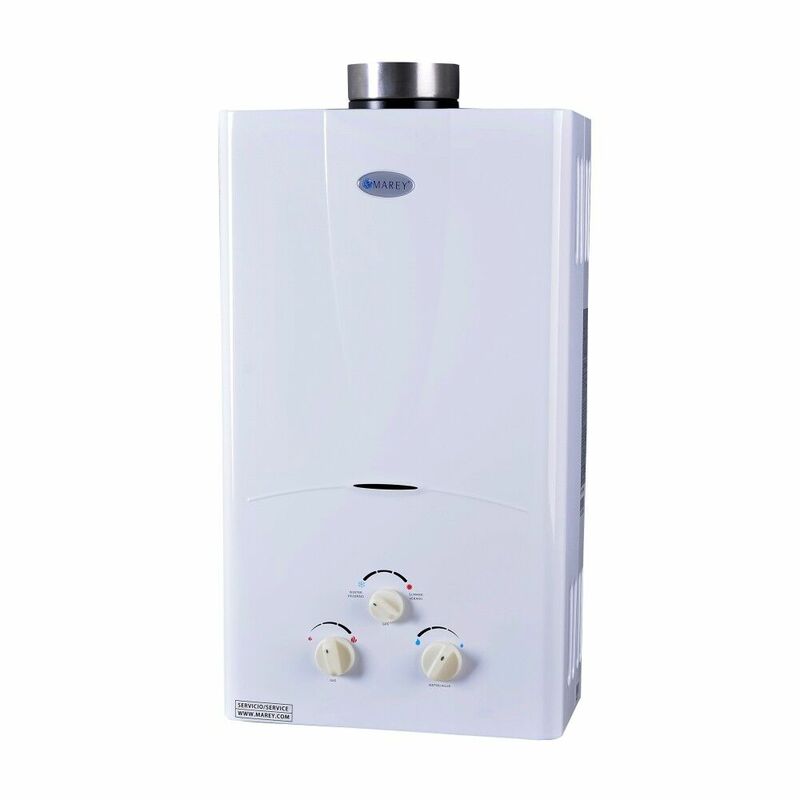 TANKLESS GAS WATER HEATER 10L LPG by Marey. Tankless liquid Propane Gas Water Heater. This powerful unit only operates on 3V, making it ideal for off-grid applications or anywhere electricity is limited. | eBay! Hi Bill, I did, and found one similar to yours, just smaller. Looking forward to testing it out.